Laozhai Mountain - the ideal viewpoint to watch sunset overlooking the Li River! Laozhai Mountain is a mountain with steep steps located in the Yangshuo countryside near Xingping Old Town (approximately 40 minutes drive from Yangshuo central). 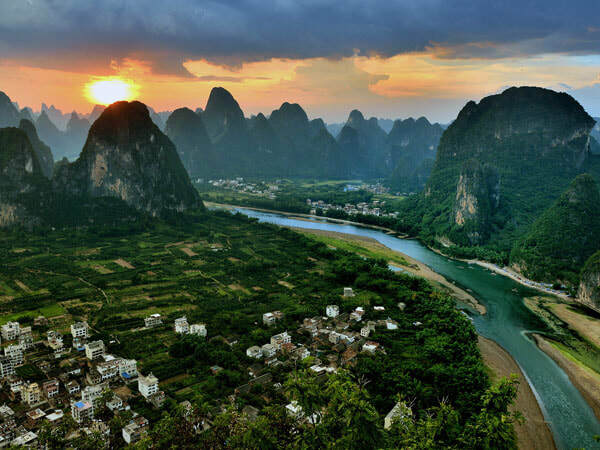 The mountain is considered as one of the most beautiful places throughout Guilin and Yangshuo to watch sunsets – overlooking the spectacular karst formations, winding river, town and valleys below. Visitors to Yangshuo are always amazed at the views from the top of Xianggong Hill and the karst landscape along the Li River. When travelling to Guilin, visitors also love experiencing scenery close-up and climbing some of the karst mountains in Yangshuo countryside. Compared with Xianggong hill, Laozhai Mountain is less popular as it is a much more difficult and in some ways, more dangerous mountain. Furthermore, it is much more challenging to climb the mountain due to its steepness, slippery steps (after rain) and a ladder near the top! But once getting to the top of the mountain and appreciating the views there, visitors always find it's worth the climb as they're presented with incredible scenic views! If you would like to visit Laozhai Mountain for photography purposes, the best time to visit is during sunrise or sunset. If you are more interested to photograph the sunrise, it is suggested that you stay overnight in Xingping as the town is located close to the mountain. Laozhai Mountain is getting more and more popularity among photographers and adventure enthusiasts. There is limited space on the top for perfect photographing and generally speaking, it takes one hour hike up to the top of the mountain. If you want to get ideal photographs for the sunrise, it is recommended that you start climbing the mountain at 04:30am and please remember to bring a flashlight with you. If you are interested to catch the amazing sunset, it is also recommended that you start climbing the mountain at 04:00pm to take up the best spot for photography. The best months for photography at Laozhai Mountain are generally from April to November. Laozhai Mountain stands in the Xingping town area of Yangshuo County. Yangshuo Town is located 29 kilometers from the hill. And the the easiest way to travel independently is either via foot or electric bike from Xingping Old Town. Due to the steepness of the mountain, it requires good body conditions to climb the dangerous mountain. Children under 10 years old and the elder above 60 years old are not recommended to climb it. Please wear hiking shoes or anti-skid shoes when visiting Laozhao Mountain. Climbing the mountain is moderate-challenging and slightly dangerous. Interested in visiting Laozhai Mountain on a Tour? Wendy Wei Tours offers a variety of different packaged tours as well as custom tours including Laozhai Mountain, among other attractions and destinations. To find out more, please visit our Tours page or Contact Us directly to find out more.